Figure 1. This building in Shishmaref used to be farther from the sea. Climate change is causing the shore to wash away. Eventually, this building will have to be moved, or it will collapse. Frozen ground is affected by climate. What is climate? While weather refers to the conditions in a particular place over a short time, climate refers to the weather over a very long time. When people say, "It is cold today" or "We had a cold winter last year," they are talking about the weather. When people say, "Alaska has very cold winters" or "Kansas gets an average of fifteen inches of snow each winter," they are talking about climate. If climate changes, frozen ground also changes. The story of Shishmaref, Alaska, shows how climate can affect frozen ground. Five hundred people live in Shishmaref, a small town on the Seward Peninsula of Alaska, near the Bering Strait. The Inupiaq people have lived in the area for thousands of years. But Shishmaref is falling into the sea. The townspeople may have to leave their village forever. 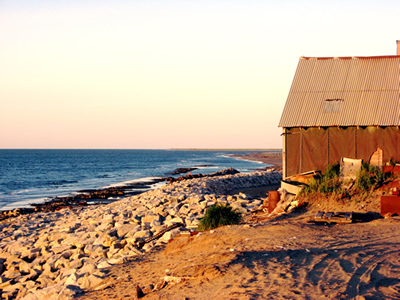 Shishmaref is built on permafrost along the coast of the Bering Sea. In the past, summers were short and cool. Winters were very cold, and the ground stayed frozen. Sea ice protected the shore from waves even in the summer. But the climate has warmed. The summer sea ice that protected the coast has melted away, and the permafrost has thawed. Now waves batter the shoreline in summer, washing away the coastline. Every year, about seven meters (twenty-three feet) of Shishmaref washes into the sea (Figure 1). The people of Shishmaref have moved their buildings away from the shore, and have put rocks and sandbags down to protect the coast. But the waves are still washing the land away. Villagers plan to move the town to a new site. When people talk about climate change, they are usually comparing the recent climate to climate over the past century, or longer. Climate change is measured over many years. It means more than just a few seasons that are cooler or warmer, or wetter or dryer. Some people also call this recent change global warming, meaning that Earth's average temperature is increasing. Natural processes can make Earth's climate warmer or colder over long periods of time. But people have begun unintentionally changing Earth's climate. The research of thousands of scientists all over the world indicates that human activity is causing Earth to warm. Burning coal, oil, and natural gas to create energy releases greenhouse gases. These gases cause Earth's average air temperature to rise. This is called global warming. As Earth warms, climate patterns change. Climate change already affects some parts of the world, particularly the Arctic. The Arctic has a lot of frozen water, in the form of ice, snow, glaciers, and frozen ground. The surface of snow and ice is white, so it reflects most solar energy back into space. But a small change in temperature can be enough to start melting the snow and ice. When it melts, the ground or ocean is exposed. The ground and the ocean surface are dark-colored, so they absorb more solar energy. The change from white, reflecting surfaces to dark, absorbing surfaces means a big change in heat. So warming can happen faster in the Arctic than in warmer regions. The effects of climate warming will be different all over Earth. For example, a warmer Earth overall could increase moisture in the air, resulting in more rain and snowfall in some places. Other areas may get drier, affecting vegetation. The ground could freeze in a few new places, while thawing in others. See What Affects Frozen Ground? for more information about how changes in temperatures, weather patterns, and vegetation affect frozen ground. Scientists study frozen ground to learn more about past climate. Frozen soils contain information about past climate change. Some permafrost has been frozen for tens or hundreds of thousands of years. This old permafrost may contain material from plants or animals that used to live in the area. The animals and plants give hints of what the climate was like then. Scientists can also study the chemistry of the ice that froze long ago in permafrost, and learn what the atmosphere was like then. Studying formations in frozen ground, like thufur, can provide information about the past conditions that caused them to form. Changes in frozen soils are a strong indication of climate change. In remote, cold regions, where people have not taken many temperature measurements in the past, frozen ground is an especially important record. Does frozen ground affect Earth's climate? Frozen ground does affect Earth's weather and climate. Surprisingly, seasonally frozen ground makes the air a little warmer than it would be otherwise. When soil freezes during winter, it releases heat to the atmosphere. When water changes from liquid to solid ice, heat is released. Soil can also store up heat from the Sun. Frozen soil releases more of this heat than soil that is not frozen, because frozen soils conduct heat better. Frozen soils also help to hold moisture. Frozen soils are waterproof. They can act like a concrete layer, especially when the soil is saturated with ice. A thin layer of frozen soil stops moisture in the layers below from evaporating. So frozen ground helps regulate this water cycle. 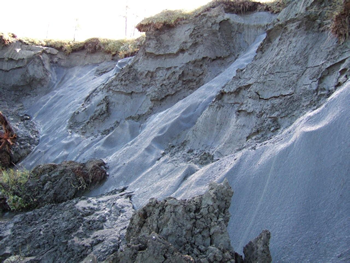 Permafrost also affects how much moisture is present in an area. 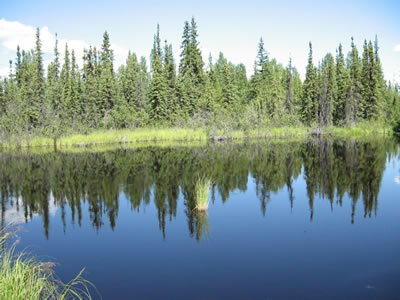 Permafrost areas have many wetlands. Water on the surface, from melting snow, summer rains, and melting ground ice, cannot get through permafrost. The top layer or active layer of soil may thaw and let water through. But underneath it, the permafrost acts like a waterproof barrier. So ponds, lakes, and marshes are common in the summer. 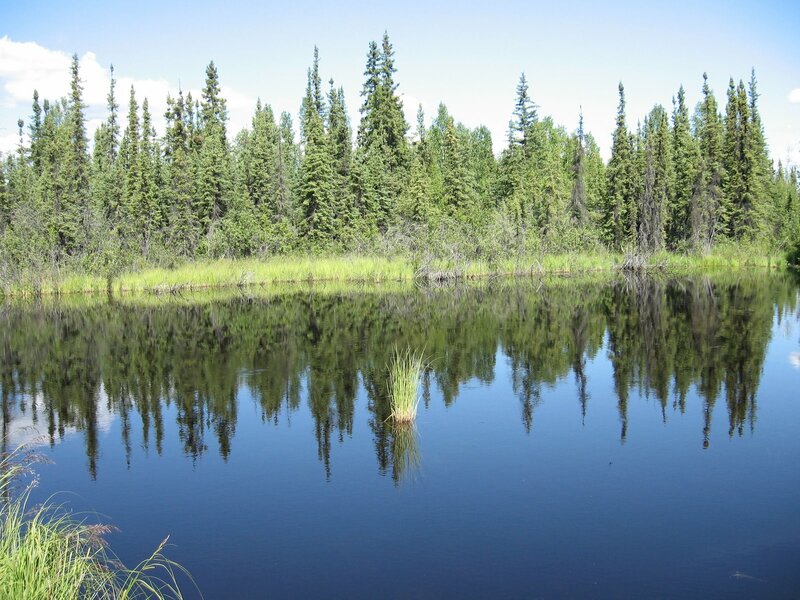 These wetlands are important to the plants and animals that live in permafrost areas. Many areas with permafrost get very little rain and snowfall. Without permafrost, water would soak in or run off the land, and the region would become very dry. Frozen ground also affects the way that carbon cycles through an ecosystem. Soil normally releases carbon into the atmosphere. This carbon comes from decaying plant and animal material in the soil. If frozen soils are cold enough, they will stop releasing carbon. So more carbon stays trapped in frozen ground. Figure 2. The area inside the solid line marks where permafrost exists today in the Arctic. The dotted line shows where the permafrost boundary might be by the year 2090. Permafrost in southern areas may thaw because of climate change. Some carbon has been trapped for hundreds of thousands of years in frozen ground. This occurred during a period of Earth's history called the Pleistocene. The Pleistocene period began 1,800,000 years ago, and ended 10,000 years ago. It was an ice age, meaning that more of Earth's water was frozen than today. The oceans contained less water, and ice sheets and glaciers were much thicker and covered a much larger area than they do today. Some of the ground that froze during this period is still frozen. It is called relict permafrost. Some places that are covered in ocean today were exposed ground then. The exposed ground froze, and stayed frozen, even when the climate changed and covered them in water. Scientists call this frozen ground under the ocean subsea permafrost. See Where is Frozen Ground?, Figure 4, to see where subsea permafrost is located. How does climate affect frozen ground? If the Earth's climate warms, the ground will warm up. Permafrost and frozen ground around the world may eventually thaw and disappear. The amount and thickness of seasonally frozen ground would decrease. The active layer, where the ground freezes and thaws each year, would get thicker. More taliks would form, and eventually, very little permafrost would be left. Seasonally frozen ground and permafrost will not reach as far south as they do now in the Northern Hemisphere (Figure 2). Rising temperatures will also change how permafrost affects the land. As the active layer becomes thicker, the landscape may change. The ground can become weak. In hilly areas, thawing can cause landslides. In some areas, thawing changes the landscape, creating slumping ground, unstable forests, and shallow lakes (Figure 3). These landforms are examples of thermokarst features. Figure 3. Increased thawing of frozen ground could create more thermokarst features, like this lake. Are places with frozen ground getting warmer? Earth's climate is already warming, and frozen ground has already begun to change. Scientists have found that there is now ten percent less frozen ground in the Northern Hemisphere than in the early 20th century. Ten percent equals more than five million square kilometers (two million square miles), about two-thirds the size of the continental United States. Scientists are also seeing other changes. The ground is not freezing as deeply as it used to in winter, and the ground is not staying frozen as long. In Russia and China, scientists have found that the active layer became much thicker in the last fifty years. In Siberia, it is up to 25 centimeters (10 inches) thicker than it was fifty years ago. On the Tibetan Plateau, it is up to 100 centimeters (40 inches) thicker. As the active layer becomes thicker, the permafrost layer underneath it gets thinner. All of these changes affect how plants grow, and how carbon and water cycle through the environment. Plants, animals, and people are already being affected. See People and Frozen Ground for more information on how climate change and frozen ground are affecting people. Scientists think that Earth will continue to get warmer. Greenhouse gases in the atmosphere are still increasing. Climate scientists believe land temperatures could increase three to five degrees Celsius (five to nine degrees Fahrenheit) by the end of the 21st century. If that were to happen, permafrost that is between 0 and -2.5° Celsius (32° and 27.5° Fahrenheit) would thaw, mostly affecting warmer permafrost found in high mountains, the Tibetan Plateau, and the interior of Alaska. Eastern Siberian permafrost is thicker and colder, so more of it would stay frozen. Figure 4. Yedoma is a type of permafrost that is very rich in carbon matter. If yedoma thaws, it can release large quantities of greenhouse gases. This is the yedoma exposure at the famous "Duvannuy Yar" location on the Lower Koluma River in Northern Yakutia, Russia. What will happen to the carbon frozen in permafrost? After they die, plants and animals decay. This process releases methane, carbon dioxide, and other greenhouse gases. These gases move through Earth's carbon cycle. The carbon cycle helps sustain life on Earth. The amount of these gases released has been steady for a very long time. Earth's climate is in tune with the way these processes have been occurring. But freezing stops the plant and animal from decaying. Some areas of permafrost have been frozen for thousands of years, preserving the plant and animal material trapped in its soils. If this permafrost thaws quickly as a result of climate change, the stored-up plant and animal matter would decay quickly, too. Permafrost can contain a lot of plant and animal material, so it could release a large amount of carbon dioxide and methane into the atmosphere. Scientists think that the amount of carbon trapped in permafrost equals the amount of carbon already in the atmosphere. The additional gases could speed up the rate of global warming. Then even more permafrost could thaw, releasing even more gases. Scientists are still studying the amount of carbon stored in permafrost and how quickly it might break down. For example, scientists found a type of permafrost that is very rich in matter from dead plants and animals, called yedoma (Figure 4). Yedoma is a type of relict permafrost, left over from the Pleistocene period. It mostly exists in Siberia in northern Russia. If all yedoma were to thaw, it could release a very large amount of carbon to the atmosphere, having a dramatic effect on global climate. To learn more about carbon frozen in permafrost, see Methane and Frozen Ground. 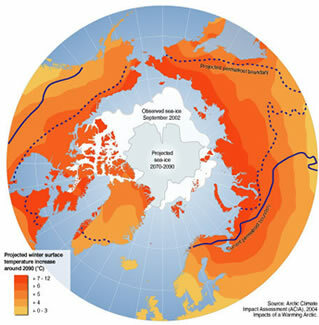 Can thawing permafrost affect sea level? When permafrost thaws, the ice frozen in the soil becomes liquid water. Some water remains and forms ponds. However, some flows to rivers and oceans. If all the permafrost in the world thawed, it could release enough water to raise global sea levels by 3 to 10 centimeters (1 to 4 inches). This might not seem like very much water. But it is enough water that cities along coastlines might have to build walls to keep the sea out, or people might have to move to higher ground. Scientists are studying the ways that permafrost could affect sea level. For more on the ways that scientists study permafrost, see Studying Frozen Ground.